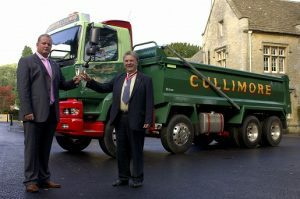 The name of Moreton C Cullimore, my late father, has been associated with aggregate and road haulage businesses in Gloucestershire and surrounding counties for many years now; indeed this section is a celebration of the 75th anniversary of his original foray into road haulage. Those early tentative steps soon became major strides and led to the progressive development of his operations into the well-respected and multi- faceted business we are today. My great grandfather and grandfather were farmers and hay and straw merchants having horse-drawn carts for deliveries. I recall being told by my father that it took one and a half days to load, deliver and return, when he and his father delivered hay and straw from Frocester to Cheltenham. In the early 20’s horses stabled overnight in yards in the High Street where today stands the Regent Arcade. The late 1920s were of course a very bleak commercial period in British history, and anyone setting up a new business venture at that time needed both confidence in their own abilities and a realistic vision of what might lie ahead – both in terms of potential pitfalls and future opportunities. Modern management tools such as business plans had not then been conceived, and the 1920s entrepreneurs were driven quite simply by the need to provide for their families. My family had been farmers in the Vale of Berkeley for 400 years but my father moved to Lypiatt (on the hills above Stroud) in 1925. Moreton was one of the first in the local farming community to have the vision and courage to invest in motorised transport. Thus in 1927, he purchased a second-hand Ford Model T truck; his plan was to facilitate the transportation of his milk produce and livestock to local markets, and return with supplies to meet the family’s own needs. Indeed, it is believed his Ford was only the second motor vehicle to be used for the conveyance of livestock in Gloucestershire. His neighbours were certainly impressed by the advantages of the Model T over their own horse-drawn carts, and it was only a few weeks after its purchase that the requests started coming in for the Ford to take a few pigs here and a few sheep there, to market. Moreton quickly recognised the need for a more formal arrangement and therefore set himself up as a local haulier. So successful was he that within ten years he had a fleet of some ten trucks on the road, running the business alongside his farming commitments. The family farm continues in business at Lypiatt today. My parents were married at Rodborough Church, Stroud on 7th June 1934. My mother, Lillian Isabel Cullimore, helped with the accounts in the early years, giving up promotion to Swindon and her job as Departmental Head at Boots the Chemist in Stroud. During the 1930s, motor vehicles, even in the more rural areas, became much more commonplace, but by offering a reliable service and maintaining good working relationships with all of its suppliers, the Cullimore business went from strength to strength. Those values continue to feature prominently in our business ethos and there is little doubt that they have greatly assisted in the tremendous success of the company through its first 75 years. The principal developments during those years are outlined in this section which will give a little more insight into what goes on behind the well-known name. Tom Ireland had been with Red & White Buses and came to work for Moreton in the early 1930’s, looking after the maintenance until his retirement. He was with us for over thirty years and during the Depression he didn’t draw his wages for a period of time. Bill Dalby left Tom Morris Sand & Gravel and joined us before the War. He was with us for 26/7 years until he retired, and then carried on part time until his death in 1974. Both men were loyal servants of the Cullimore interests. In 1961 I joined the family business following completion of academic studies at Wycliffe College and a London-based HND building course, including civil engineering. In 1969 I took over as Managing Director with my father remaining as Chairman until his death three years later. In May 1972 I succeeded him as Chairman and Managing Director of the Cullimore group of companies and continue the role of Chairman today. Having always been a very active and conscientious supporter of the national trade associations relevant to the company’s line of business, I served on the Board of Directors of the Road Haulage Association (RHA), having been Vice Chairman of the Board, Chairman of the Commercial Services Committee at national level in recent years, and a previous Chairman of the Western Area; for many years an active member of the Sand & Gravel Association (SAGA), serving as National Chairman of the Industrial Relations and Transport Committee; and elected Fellow of the Institute of Quarrying and Fellow of the Institute of Directors. Moreton C Cullimore (Gravels) Ltd has received three awards for outstanding restoration in the Cotswold Water Park, and in 1998 I received the Brewis Trophy for outstanding service at National level to the sand and gravel industry. Always having had a political profile, I was backed by the CBI and recognised in the Financial Times for my campaign for Capital Allowances. More recently I have vehemently campaigned against the introduction of the Aggregates Levy with the British Aggregates Association (BAA), and fought for fairness on fuel costs and other transport related issues in comparison to other European transport costs. Wherever possible the Company always buy British. I still reside in Stroud with my wife Julie and take a close interest in the local community. For some years now I have been President of the Stroud Show Society, one of the main fund-raising events for local charities. In earlier years I very much enjoyed horse riding and water skiing but today have little time for much more than swimming and walking the family dogs, along with other pleasurable pursuits like attending cricket and rugby matches. My son, who shares my interest in cricket and rugby, also shares the name Moreton with his late grandfather. He gained a BA (Hons) in Business & Management at Sheffield Hallam University in November 2000 going on to complete a Masters’ degree in Sports Development at the University of Gloucestershire, Cheltenham. Moreton is now Managing Director of the Company, becoming the third generation of the family to be involved in the Cullimore business.